Authenticity is all that innovators have in a world where #fakenews is both blunt instrument and rallying cry. Whether we are marketers, entrepreneurs or change agents at large corporations, the need to “keep it real” has never been more crucial. But how can authentic be “authentic” if it is a premeditated act, based on trend analysis and the desire to connect with the values of a particular demographic? With the recent implementation of GDPR and continuing controversy about foreign agents influencing our elections, it is a question I ask myself every day and one that bears discussion if we ever seek to do our jobs effectively and with any degree of authenticity to our own selves. Unlike other innovation goals, authenticity is problematic because it cannot be pursued. For instance, in all recent failed attempts to engage Millennials, we see desire outstripping understanding time and again as well-intentioned brand marketers substitute signaling for substance, talking for reflection. Among the most egregious examples: Chevy’s “#HiddenGems” campaign, where the stereotypes of Millennials as selfie-obsessed hipsters were so outrageous that the campaign spawned countless parodies, effectively achieving the opposite result among young consumers that the carmaker intended. The point here is not to beat up on anyone. Rather, it is to assure that we push beyond received notions and easy solutions. What I am aiming for is authenticity that is not superimposed on a brand. It must come from within, from the truest part of each member of an organization. A diverse workplace is a great first step. But to make a real impact, we must do more than reflect the demographics of the customers we wish to engage. The truest path is to treat authenticity as something uncovered rather than achieved. In recent client campaigns, we have found that treating the process as a personal journey. Engagement, instead of being a static condition, occurs along a continuum we call the value stream. 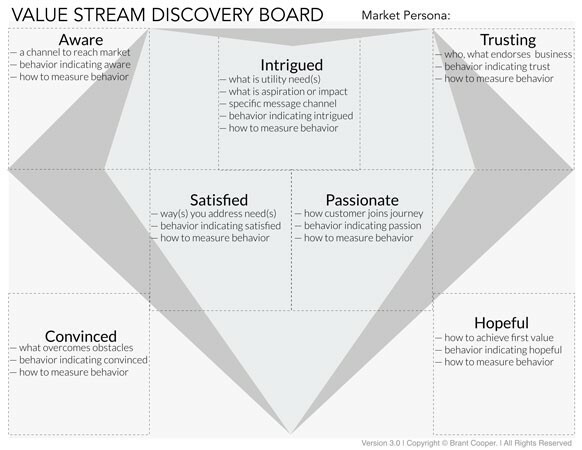 The Value Stream Discovery Board is a tool that provides a way to view a client’s or customer’s interaction with a company. It describes the journey from the customer’s perspective. It doesn’t look only at the experience with a particular product, but rather the customer’s relationships with a company—from first becoming aware to becoming passionate. Intrigued is when a potential customer first thinks, “Hey they’re talking to me. What they’re saying is interesting.” Customers are satisfied when the utility function is realized; in other words, the promise is fulfilled. Customers are passionate when they have successfully joined the journey toward achieving an emotional impact. The feeling cannot be promised to the customer since the success of the journey is shared. Sometimes this connection happens with the product itself, but more often than not is based on something else inside the business model. There is a je n’sais pas quality to authenticity. We are not sure how it happens but it is clear that it is present the closer the perception of a company or product gets to Passionate. Passionate is the benchmark; it is the point where inner values and the product or company align. An example I like to use involves an entrepreneur in Toronto who was building a music app for the iPad. The second question, however, was trying to get to the entrepreneur’s “why.” Why did he feel driven to build a business around this concept? “To save parents money” is a pretty lightweight answer. The entrepreneur can’t promise that. But the journey itself that the entrepreneur, the child and the parents go on together creates passionate customers. Authenticity isn’t the destination but is the trip itself, with the heart and the eyes both open to what happens next. 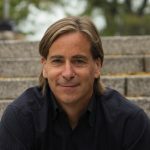 Brant Cooper is author of the New York Times best seller The Lean Entrepreneur. He also serves as an advisor to entrepreneurs, accelerators and corporate innovation teams. He is CEO of Moves The Needle, which empowers organizations to discover and create new value. I am agree with this process, personal journey. This is really essential that how we are treating our customers. Awareness is the key skill of the problem solving and selling.